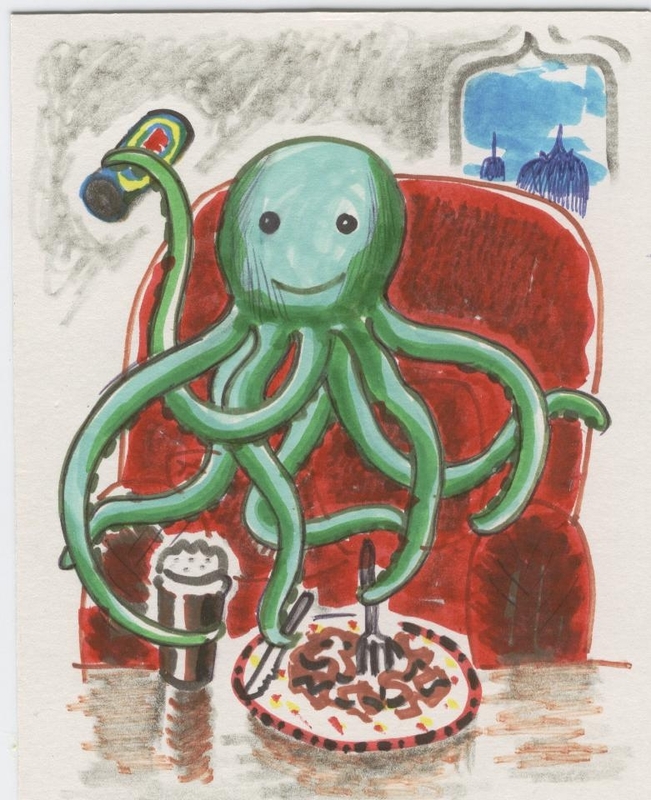 TONMO.com member octobloke has contributed another work of art from his friend Robin Davies. Per octobloke, "My friend Robin Davies did another picture of my mascot 'Asterisk'. This is him at his favourite Indian restaurant probably enjoying a nice king prawn curry." This has gotta be the most adorable -- and original -- cephy pic I've ever seen! Are there any prints of this for sale? But I'm kinda confused....which Robin are we talking about here? I don't know who Robin Davies is, but if it's the other Robin I'd be curious about when he found the time between films to take up visual arts? Glad to see the portrait of 'Asterisk' has gone down so well. Unfortunately, the pictures of him are originals and they are all on my sideboard and not for sale, sorry. Woops, I fixed that, sorry about the mix-up.